See our other barley straw products and other pond water treatment products. 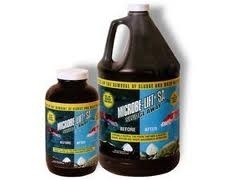 Provides "rapid and natural sludge and muck removal" Rercommended for use with all Microbe-Lift bacteria and enzyme products. Basic application rates = 1 oz per 100 gallons of pond water. 100-500 gal. Initial application 1-5 oz, Maintenance 1 oz per 100 gallons weekly for next four weeks. 501-1000 gal. Initial application 5-12 oz, Maintenance 1 oz per 100 gallons weekly for next four weeks. 1001-2500 gal. Initial application 12-25 oz, Maintenance 1 oz per 100 gallons weekly for next four weeks. 2501-3500 gal. Initial application 25-35 oz, Maintenance 1 oz per 100 gallons weekly for next four weeks. 3501-5000 gal. Initial application 35-50 oz, Maintenance 1 oz per 100 gallons weekly for next four weeks. Maintenance: Treat with Sludge Away monthly or as necessary thereafter. Has been known to temporarily darken pond water.